Balsam, Wella and Alberto. Breck. Body on Tap (but don’t drink it). Breck. Tame Dorothy Hamill’s Short & Sassy wedge. LemonUp. Juicy Green Apple. Breck. Breck Girl, Twice as Nice. Oil and Honey Twice as Nice. There was a gift of an entire idyllic day at the Chicago Art Institute earlier this summer, many hours of which were spent circling around and around the William Eggleston: Democratic Camera exhibit. The dye-transfer coloring is visually beautiful, of course — something about the heated intensity of the color giving the gritty quotidian realities within the photographs an almost surreal patina — a lacquered, Cutex-nail-polished weird glamour. Visual pleasure was only part of it, though. The tension between the visual beauty of the images, and the uneasy grotesqueries of their content, was heart-rending for me. The attentiveness — the mindfulness, if you will — of the aesthetic resonated very strongly with and for me, but it was ultimately a sense of the tenderness of the gaze that completely unraveled me. An acceptance of the shabby, the crazy, the not-beautiful, the banal, and the mundane. Everything seemingly as it is, and therefore completely unshelled. Completely vulnerable. An aperture open to aperture. And because of that tenderness of looking unspeakably beautiful. That these pictures — particularly the ones from Los Alamos — seemed full of kitschy cultural tropes from my own 1970’s childhood in Wyoming (where everything was always a little bit behind–flower power and disco a thin varnish over sedimental layers of 1950’s and rugged frontier sensibilities) is undoubtedly also part of their appeal for me: a Jarrellian Lost World of sorts, maybe. And it’s not an easy nostalgia, or a Lost World that I would ever care to return to, but rather a place of terrible vulnerability, helplessness, and suffering. Eggleston’s photographs capture this sense of a Lost World in the fleeting instant at which it’s lost in each passing moment, and it’s a Lost World that’s revealed as uncertain, vulnerable, and in pain; chock-a-block with fraying banalities of kitsch and schlock — banalities that are recognizable from my own cultural vocabulary and which ultimately end up, perhaps, underscoring my own poignant sense of the Japanese aesthetic of utsuroi, or evanescence. 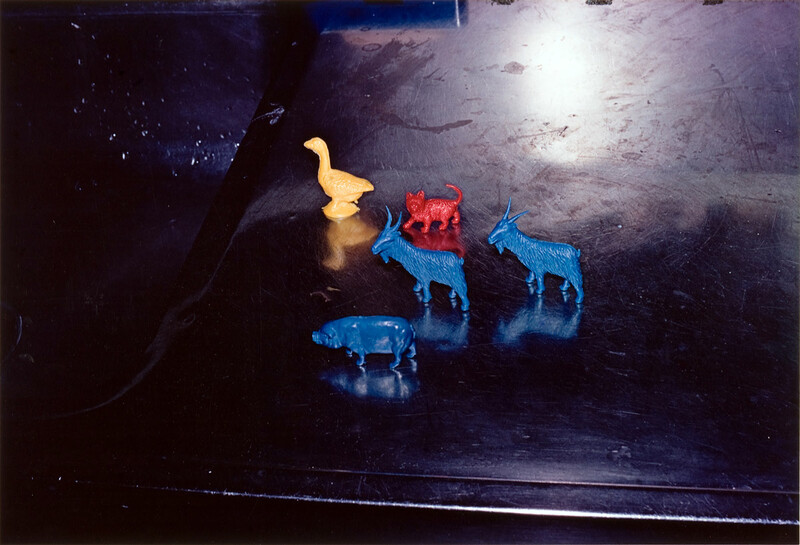 This image, an untitled photograph of simple plastic animals on a worn table, made me weep the first time I saw it. A completely personal response in many respects, I’m sure, but still . . . why? How? Maybe something about the aleatoric/chance randomness of the animals almost like a John Cage composition. (In fact, for some reason it made me think of the colored vocal lines in “Aria (1958)”.) Maybe it’s the questions that get raised — and every Eggleston photograph raises unanswered questions. Maybe it’s the attentiveness of the eye that notices. Or maybe the tenderness of the framing and the recording. Democratic is the word that is used for Eggleston’s approach/aesthetic, and yes, this seems true to me, but what I feel so powerfully moved by is, I think, the large compassion of his vision. Nanami the Kitten: [nuzzling Nobu the cat’s belly] Got milk? Nobu the Cat: Dude! WTF?! Nanami the Kitten: [persistently] Got milk??? Nobu the Cat: [resignedly flopping on his side ] Whatever. Heartichoke to Nanami the Kitten: Hey, where did all your whiskers go? Why don’t you have any whiskers? Nobu! Did you chew off all the kitten’s whiskers? Heartichoke to Nobu the Cat: Don’t you make the ajapa face at me, mister. In the sixth night of Natsume Soseki’s Ten Nights’ Dreams, Unkei the Sculptor is carving a Nio, a temple guardian, in front of spectators. Unkei’s sculpting technique is diffident, offhand, unconcerned, yet exquisitely confident. The dreamer wonders how Unkei does this, and is told that Unkei merely digs out the Nio that’s been buried all along in the wood. It’s like digging stones out of the ground, another onlooker says. He cannot make a mistake. And so what, I wonder, might be hidden inside a page? Or inside this screen? Inside your screen? What does my Nio look like? What does yours? What if my Nio is simply the stones themselves? Virtual stones, at that. Virtual stones, for the metaphorical stones, for the metaphysical Nio. But I like the stones. I’ll make a small pile of them here. Like gold new potatoes. And then later I’ll cook them with rasins and cumin and ginger and snap peas and cinnamon. Do you ever feel as if there is simply not enough frolicking in your life? A paucity of play? A dearth of divertissement? Unending stretches of bleh with no hope of a rollicking good time in sight? Do you ever catch yourself wistfully wondering, “Where’s all the frippery, buffoonery and tomfoolery gone to?” Do you just want to let loose sometimes and gambol a bit? Go on a fandango? Indulge in a bit of skylarking? Set forth on a clambake, a jamboree, or a saturnalia? Get up to some high jinks? Have yourself an escapade? If so, what you really need is a good cavort. So kick up your virtual heels, jump onto the e-bandwagon, and support International Cavorting Day! Go for it . . . support the cavort!